Virgins O.R Pigeons are a trio from Greece, comprising of Pierrot, EL and Miyuki. The original line-up, with a number of collaborations in various music projects in the past, decided to form a band together and combine their versatile backgrounds. In 2002, with ex-member Steph, they started experimenting with digital and analogue sounds, and united their passion for technology and fired up guitars, hence creating a hybrid of electronic music with a dark twist. Their songs are ranging from frenzic aggressive EBM to more down tempo yet still powerful anthems with hypnotic and often haunting melodies. They believe in having a strong and eye-catching stage presence to compliment their music and, drawing elements from Visual Kei, they adjust it to fit their own identity and perception of “performance” and “image” in general. Starting in Greece, a country with a limited number of bands in the greater genre of industrial and electro, they immediately stood out from the crowd with their first ever live performance with Japanese band BLOOD. They headlined their first gig soon after, at the 8ball club in Thessaloniki, which proved out a huge success. The band was discovered by the Japanese independent label Darkest Labyrinth (ex-Cure) and in March 2007 their debut album, titled “Place No Reliance” was released. As summarized by the band itself, this album is “…A Manifesto for the masses, a sinister antidote for your spiritual decadence…”. And indeed it is. 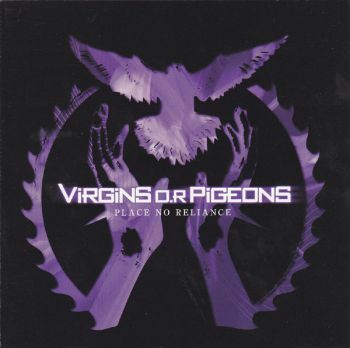 Virgins O.R Pigeons made their first international tour in late summer of 2007, appearing live in northern Europe and were welcomed with great enthusiasm. The remix of their hit song “Existe”, the “Violated Virgin Remix” was included in the Alfa Matrix compilation Endzeit Bunkertracks act III.